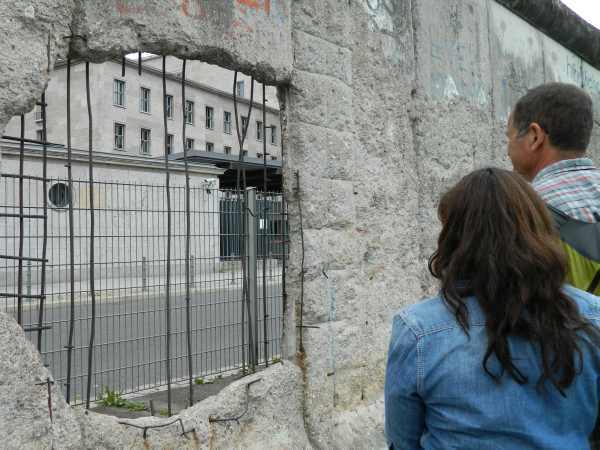 As Germany’s capital, this city has has turbulent history that has touched and changed our most recent history; the fall of the Berlin Wall and the reunification of Germany. 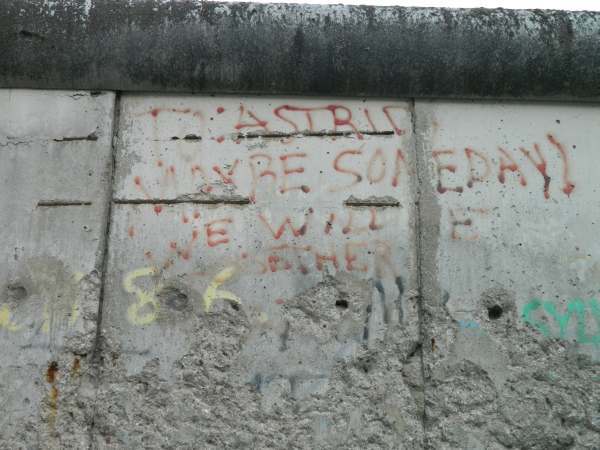 November 9, 1989 marks the day day that East Germans and West Germans were no longer separated by two million tons of concrete and 700,000 tons of steel, not to mention attack dogs, trip wires, traps and armed guards. Our first day we managed to visit the Berlin Wall Memorial, the Brandenburg Gate, the Reichstag and various historic squares. We enjoyed of wonderful lunch and dessert in the Jewish Quarter, but all the while my thoughts were on the impending arrival of Giana, who we had not seen for three months! We returned to camp and decided to spend the next day on our bikes, shopping for a used bike for Giana to use during the two weeks she would travel with us. The results? We rode for four and a half hours and finally found a wonderfully helpful shop named Little John Bikes. He located us a perfect bike for Giana’s use at a reasonable cost. He was so kind that he threw in a seat cover for her and Steve’s bikes and a key chain! We then, that evening at 10:30 p.m., rode our bikes to the train station to meet Giana’s plane. We were a little late, but her being the resourceful traveler she is, found the train station, the correct incoming train, and was waiting for us! 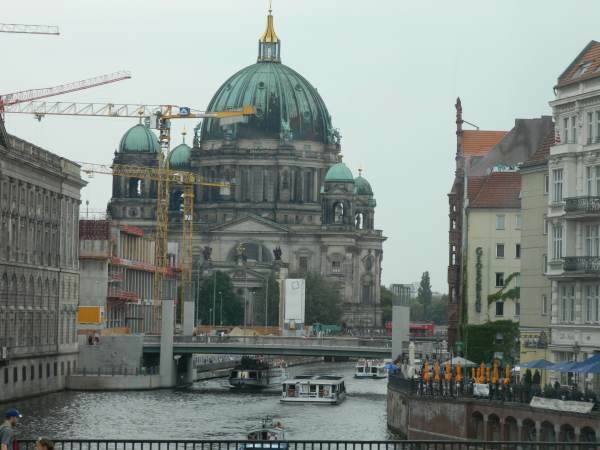 On our fourth and final day in Berlin, all three of us visited many of the historical sites in Berlin. The one that we learned the most from and definitely touched us was our visit to The Wall of Terror. This location is at the sight of the former Gestapo headquarters, once the most feared address in Berlin. It was chilling to see. We learned about Hitler’s plan for Poland. 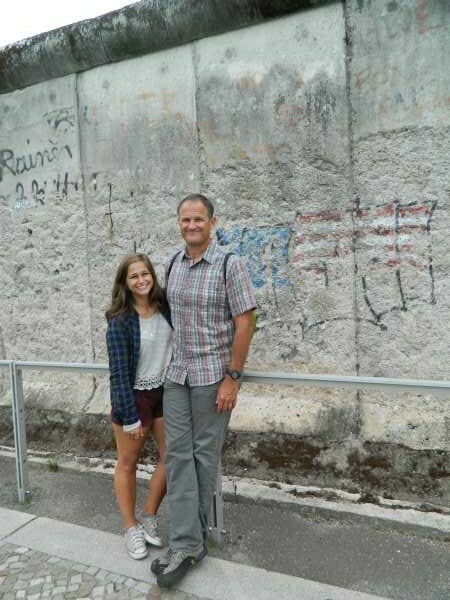 We also walked along an original fragment of the Berlin Wall that stretched along the side of the street. After such a heavy day, we returned to camp, and took our three bikes on a long evening ride. After a three hour delay, a stomach ache on my twelve hour flight to Stockholm, and a customs agent who barely nodded at my cheerful hello, my trip to Europe was off to a rocky start. Yet, after my first hot shower in over two months, in my opinion, Europe had welcomed me with open arms. 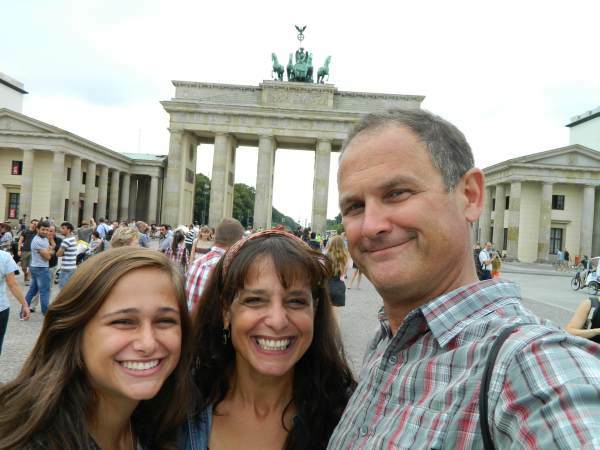 I had been living in Nicaragua for the past two and a half months, and with less than twenty four hours on US soil, I crazily decided to meet my parents in Berlin to join them on their travels before starting school again at the end of August. So, bienvenidos to this special edition blog post with me, guest writer, Giana Amador! (Sorry, I’m still adjusting to living in a non-Spanish speaking country). 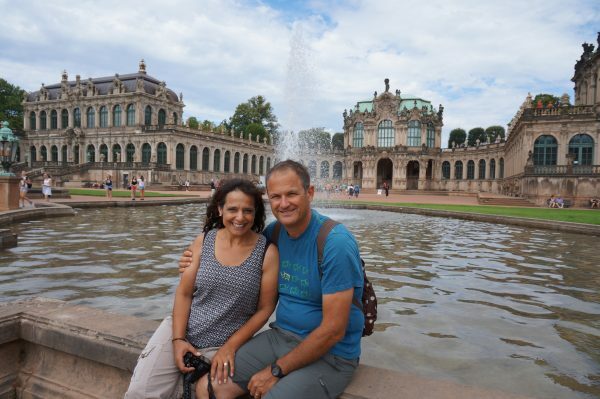 After just one day in Berlin for me (and four for my parents), we headed to Dresden, a city most commonly known for its destruction from the bombings of WWII. Yet, what is even more unbelievable was the preservation of history and reconstruction that occurred after such staggering events. 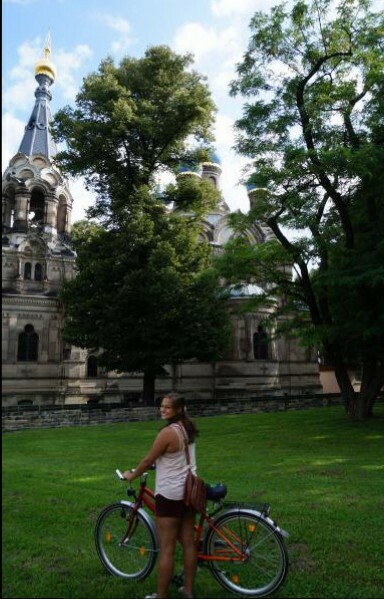 We set off on our Dresden adventure on bikes, with a list of sites we wanted to see. 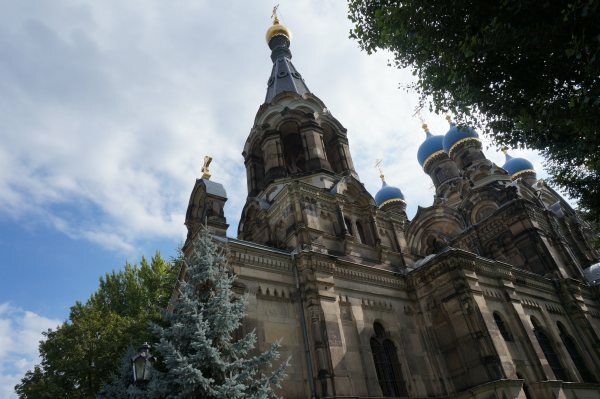 We first happened upon a Russian Orthodox Church whose beautiful golden spires stood out from the more western architecture we had seen in Berlin. It was obvious that we were traveling to an area of Germany more heavily influenced by Russian culture. Bike ride through town on my new bike! 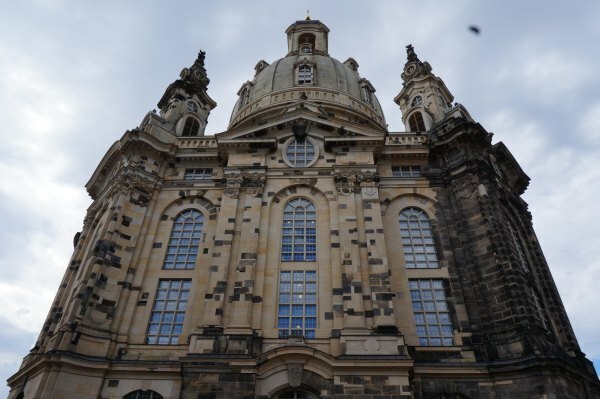 Next stop was Old Town Dresden, a cultural center with many old churches and government buildings that now serve as museums. 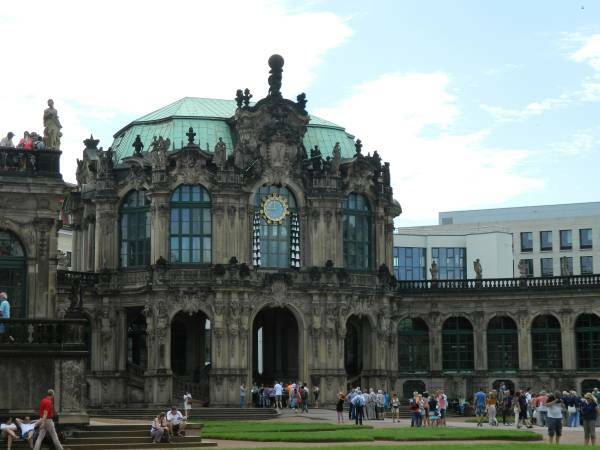 My particular favorite was the Zwinger, a large courtyard surrounded by magnificent buildings on all sides commissioned during the Golden Age of Dresden (mid-18th century) by prince elector of Saxony and king of Poland Friedrich Augustus I, nicknamed Augustus the Strong. The opulence in the Zwinger is fabulous and shocking, especially considering the grounds were only used for celebrations and not official business. 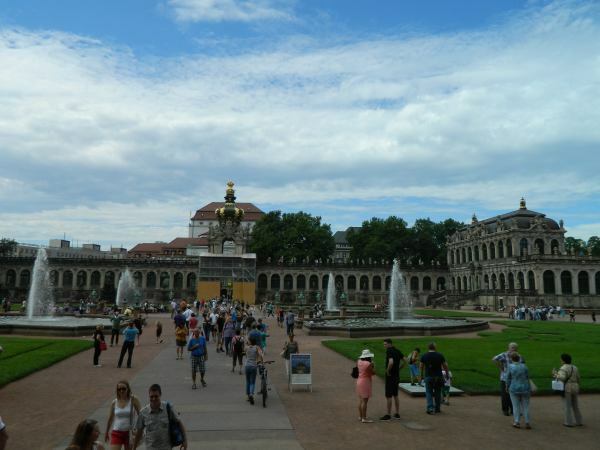 The grand courtyard of the Zwinger. Quite arrogantly, Augustus ordered many renderings of himself in the Zwinger, including a statue of the mortal Atlas (with his facial features) holding the earth on his back. It fits Augustus’s nickname to embody someone strong enough to hold the earth. However, even more fittingly, in Greek mythology, Atlas was sentenced to a life of punishment for his haughtiness and his attempt to overthrow the gods of Mount Olympus. Similar to Atlas, Augustus’s pride caused him to miss an important detail – he didn’t have enough money to finish his masterpiece. The Zwinger was left unfinished until after his death. Atlas at the crown of the building. 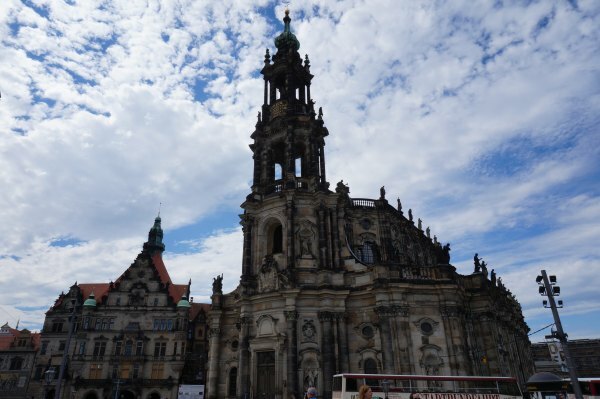 Dresden was heavily bombed in 1945 and most of the buildings were reduced to ruins. Different from the other “old” buildings in the city, the Zwinger was the only complex to be restored under communist control. Yet, the citizens of the city had anticipated this, and hid their most important artwork and cultural items in underground cellars in the countryside. They remained safe, however, the rest of the city was reduced to ruins in only one night by American and British bombs. The buildings shown below, along with many others, were left in pieces until Germany was reunified in 1989. However, the reconstruction yielded an awe-inspiring display of complexity and beauty! 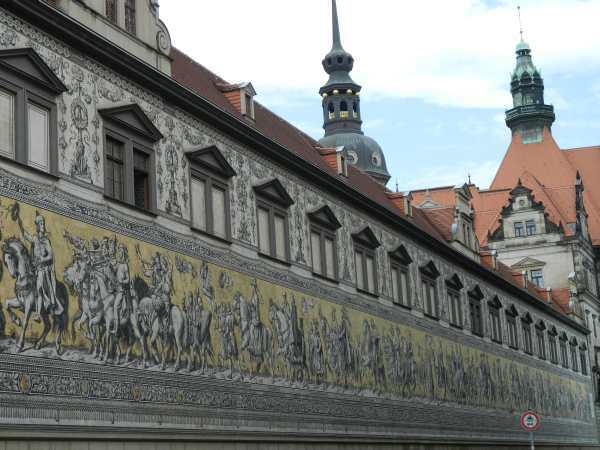 A mural depicting the royalty over centuries. Still on bikes, we came upon a little piece of home in Dresden! This statue, titled Rotante Dal Foro Centrale by Italian sculptor, Arnaldo Pomodoro, is a sister statue to one at UC Berkeley, where I go to school, in addition to other locations across the globe. 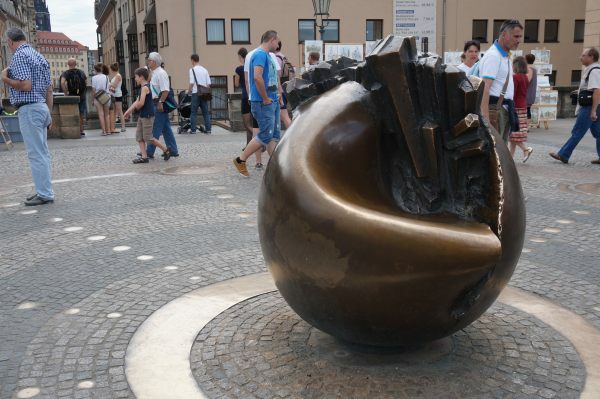 The statue represents the coming of a new, transforming world erupting from the inner sanctity of the current world order. 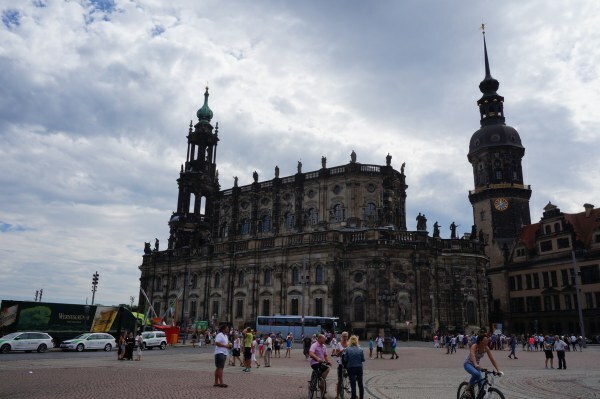 I think this perfectly fits phoenix-like persona of Dresden – rising from the ashes of WWII, into a beautiful and history filled city. 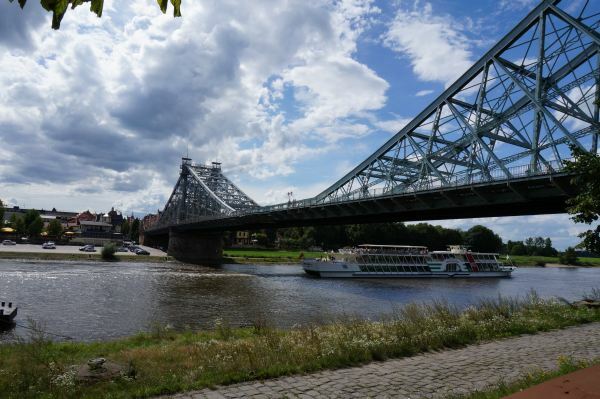 We biked home 15 miles over Blue Wonder, an impressive suspension bridge which was built when the technology was still new, and rounded out our day with lunch on the Elbe River. 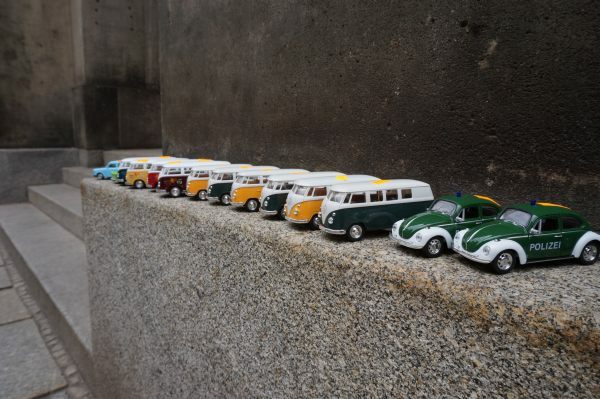 A herd of wild VWs found in Dresden! Hi everyone! it is so good to see all three together in Europe! 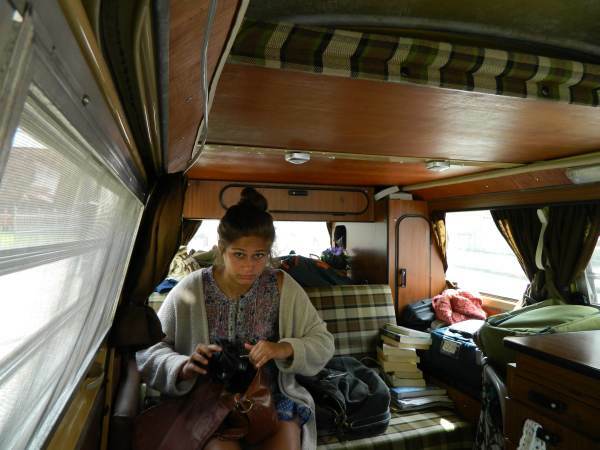 Glad Giana made it out of Nicaragua ok.
Wow……………magnificent! ! The guest writer, Giana, looks like she could be related to both of you!! Love & Hugs.